The NSMB Hacking Domain » Classic Super Mario Bros. This mini hack aims to replicate the "feel" that the first Mario game had. 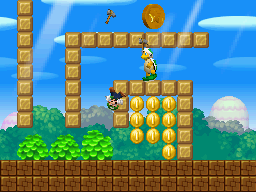 The reason I made this hack is because I'm removing the Super Mario Bros-like levels from my main hack. So instead trashing the whole idea I decided to make new (and better) levels and compile them in a 1-world hack. A friendly reminder to anyone else wanting to play is use an older version of NSMBe to patch as newer revisions don't work. Also excellent job Pedroalone, it really feels like the original Super Mario Bros. but at a better and faster pace. It's like the fan game Super Mario 63; Done very well and puts a smile on your face. I like this idea. Could someone tell me what version/s of NSMBe work can apply the patch properly? I had no problems patching with build 376, which is the one I used in this hack. As I promised, I played. There are just all good things to be said about this refined game. Who does not like the classics? This selection of Pedro Alone levels, proves that the classics are here to stay. 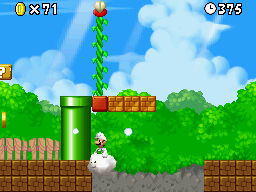 In order not to fall into the same, levels of Classic NSMB uses touches of simplicity and mastery. To make life easier for new users, the game NMP is 100% compatible without any loss of tilesets or other modifications. For the curious, exactly 100 files are loaded on import of this patch. We can really say that this patch is 100 note! Pics: Interesting secret easter eggs. It was an excellent idea to have Pedro Alone extracted to the community as these adorable levels of their previous hack. Even better, was to prepare a mini-hack with all these levels. If any user does not understand the word sense to reinvent the wheel, Classic NSMB can demonstrate this to the public. This is because the levels are not exactly a remake. 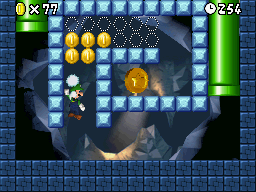 Each level has a different design, but with a classic style. 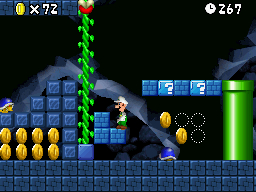 The game does not ceremony to present surprises as well positioned star pipes to explore specific locations to jump, secret areas and enemies in challenging positions. There is nothing to talk about a great mini-hack like this. Only praise. What this humble member of this community hopes now is that Pedro Alone can surprise us with the development of its full Hack, The Next Levels, as expected by members of this community. Youtube video: The 1-Castle (4:16). So, mods, the hack is finished. The thread has screens, a video and a download link. What does it need to be approved? Edit: Apparently the patch had the overlay9_0 bug. I just fixed it. Odd request, but could someone post an xdelta? I can't use NSMBe currently. Or another solution (from SaturnYoshi) would be to make the secret exit on W1-Tower the only possible choice to end the level. That way you can set the cannon to go to World 8, and upon reaching the Final Castle, the player will get to see the proper ending. The only downside is that it would force Pedroalone to make 8 more levels, for a total of 16 levels. 1* Yeah, I think I can put another message in 2-1, maybe not everyone will look at it but whatever. Btw, what do you mean with "texture w2 the same as w1"? 2* I don't get it. Bought?? 4* I tried this and believe me it is not cool as it may seem. About the tower thing, nah, 8 are enough.